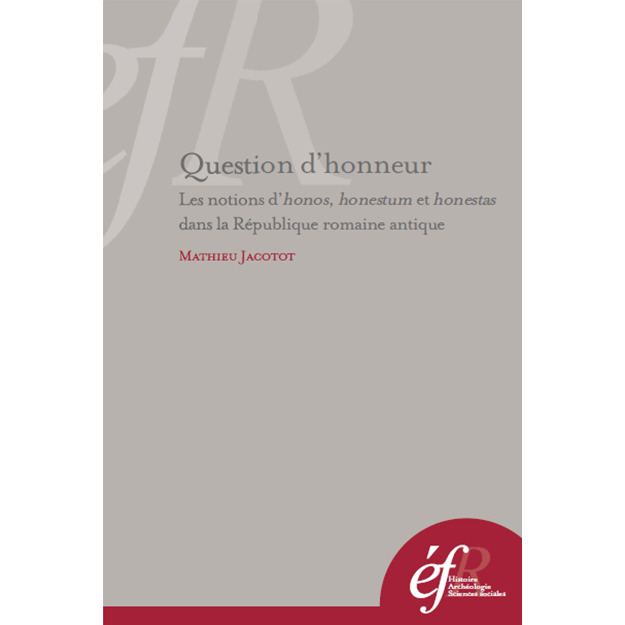 Mathieu Jacotot, "Question d’honneur. Le notions d’honos, honestum et honestas dans la République romaine antique", Rome, École Française de Rome (Collection de l’École française de Rome, 479), 2013, IX-818 pp. This mighty volume represents an extremely rich and accurate study, more interpretative than descriptive in nature, upon the material implications and the theoretical aspects of the notion of honour and its three expressions in Republican Rome. It starts from the end of the III century B.C., to which the first literary occurrences of honos date back, until the fall of the Republic, in a path proceeding from Plautus to Sallust through the meaningful thought of Cicero, which will be object of a separate monograph. The author approaches these topics employing the categories of modern anthropology and sociology and establishing a direct contact with the texts of Latin literature. The result is an interpretation that successfully considers such an authentically Roman notion as honos and its derivatives in all their complexity according to a threefold approach. The Prèmiere partie consists of a semantic and lexical analysis of honour, which focuses on the etymological origins of the notion, identified with the Indo-European root *gh̑en- ("to behave friendly"), and the relationships of synonymy or antonymy with other Latin words, such as dignitas or turpis/turpitudo. It also deals with the several nuances of sense assumed by these three notions, the gradual specialization of honos towards the social and political meanings of «marque d’honneur», «considération» and «charge publique» and the shift of honestum/honestas in an idealized concept rich in ethical contents under the semes of «morally fair» and «moral dignity». In the Deuxième partie J. undertakes an anthropological reading of the social practises of honour and their functioning, aiming to elucidate the structures that regulate the relation between the individual and the community in a lively dynamic of exchange and reciprocity between the one receiving the honores and those who permit their granting. The growing personalism of Roman politics and the concentration of the honores in the hands of a few men provoked both a progressive devaluation of honour as a "symbolic capital" – the social prestige to be increased, protected and passed on inside the groups of the nobilitas – and a reappraisal of its "economic" value, culminating in the distribution of material benefits. The Troisième partie provides an excellent conceptual history of honour through the works of Roman intellectuals, underlining the close relationship between the mounting crisis of Republican institutions and the parallel theorization of the notions of honour in Rome. This process started with Plautus, who for the first time carried out an intellectual discourse upon honour in a comic reversal that made honos the ludic object of the palliata. Then it passed through the satirical work of Lucilius, promoter of a crucial remoulding of ancestral Roman honos in the light of Greek philosophy, namely of a "passage d’une morale de l’honneur à une éthique de l’honnêteté" marked by the exhortation to vita honesta. It eventually led to the historiography of Sallust, supporter of the traditional virtus and resolute in restoring the significance of the code of the mos maiorum, which inspires a honest behaviour. The markedly polysemic nature of honour in Rome, coherent but not unitary in its composition, explains the reasons why this notion underwent a complex evolution in the Roman world. Its practical application, revealed by an exchange of tangible tokens of homage that is deep-rooted in Roman tradition and congenial to the bitter political feuds of the Roman Republic, is the starting point for a «mise en question» of honour, a critical assessment of its causes and nature, and a conceptual theorization that leads, thanks to the contact with Greek thought and a more and more evident fracture between the individual and society, to a philosophical definition of honestum: as a innermost principle of human behavior, it becomes a semantic calque of τὸ καλόν in the field of moral beauty. In this work J. brilliantly discloses the multiform character of honour as «notion fluctuante ou concept théorique, idée politique ou valeur morale, image littéraire ou ressort idéologique».